Integral e-Drive returned from a successful Professional Motorsport World Expo in Cologne, Germany where their High Torque SPM Motor was combined with the Hewland Engineering PEVT-200 EV electric transmission. High performance EV applications require efficient, high speed high torque transmissions. 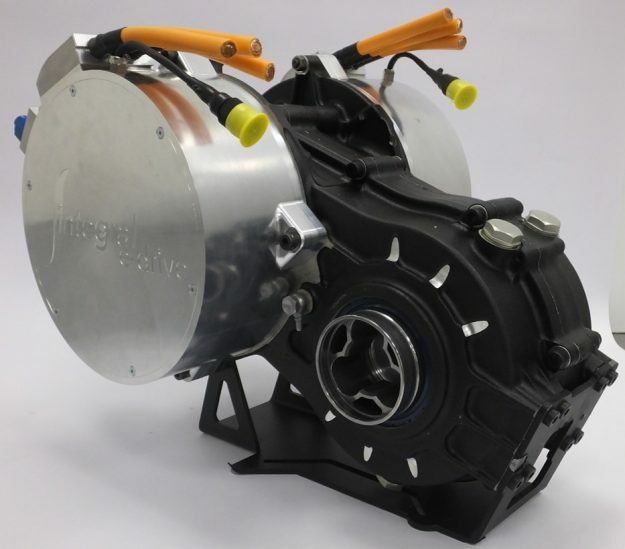 Hewland Engineering have a range of standard EV reducers which provide road and track EV customers with the flexibility to integrate their preferred electric motors with ease. The PEVT is a dual motor torque vectoring transmission optimised for weight and performance. Coming in at just 18kg, the reducer is able to transmit up to 300Nm of torque and up to 20,000rpm per side, which provides a combined powertrain potential output of 500kW in a compact package. Mounted at this prestigious expo with Integral Powertrain’s High Torque SPM Motor. This powertrain offers customers an extremely lightweight, yet high performance package. Integral e-Drive’s 4th generation automotive SPM motor delivers world leading power density and efficiency, realised by a combination of an advanced electromagnetic design, high conductivity encapsulation and their unique precision liquid cooling system. A Surface Permanent Magnet (SPM) radial flux electric motor with a 220-890V working voltage, a Peak Power of 250KW and maximum speed of 19,000 RPM. A wide range of derivative specifications are also available to suit client specific requirements. For more information visit our e-Drive website. Founded in 1957 by Mike Hewland, Hewland quickly became the world leader in motorsport transmission design, with prestigious F1 accolades. Building upon early motorsport successes Hewland now employs more than 130 people at their Berkshire UK factory and design and manufacture transmissions for customers worldwide for a variety of applications. Aside from motorsport they have seen particular success in high performance automotive, electric vehicles (EV), and light commercial vehicles. For more information please visit http://www.Hewland.com | +44 (0) 1628 827 600 | info@hewland.com.